This sundal recipe is traditional recipe and is prepared especially during navrathiri. The procedure is very simple and can be prepared as regular snack also. 1. 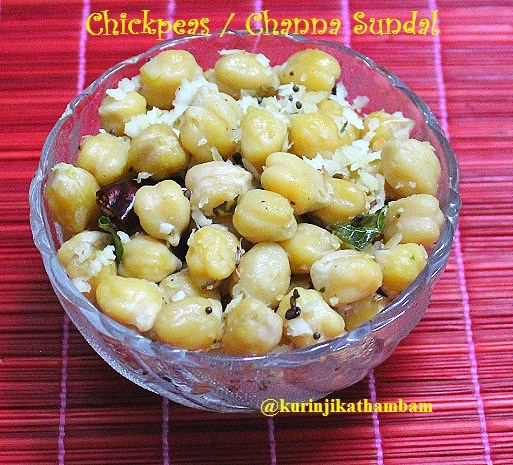 Wash and soak the chickpeas over night or 8 hours. 2. 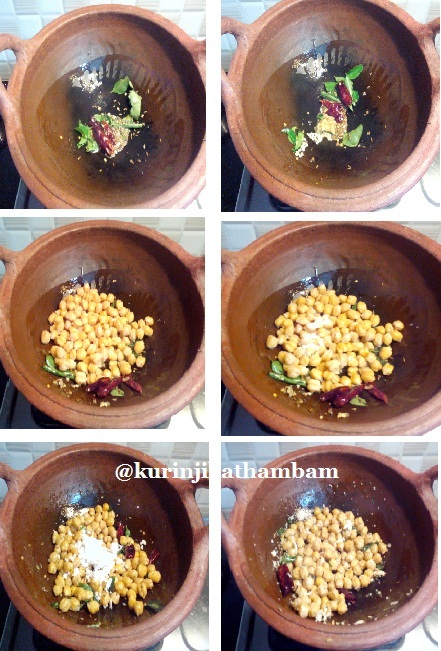 Then drain the water from the soaked chickpeas, and then add ½ cup of water and little salt. 3. Pressure cook for 4-5 whistles in a medium flame. Allow it to cool down completely. After the pressure has gone, open the lid of the cooker and check if the chickpeas are cooked or not. Suppose chickpeas are not well cooked, again pressure cook for 2 more whistles. Again allow it to cool down and drain the water completely. Keep it aside. 5. Then add urad dal, red chillies (break them into half), curry leaves and grated ginger. Sauté for a min. 6. Now add the cooked chickpeas (from step 3) and sprinkle required salt. Mix them well and cook in a low flame for 2-3 mins. 7. Finally add the grated coconut and mix them well. Immediately switch off the flame and transfer it into serving bowl. Healthy and tasty sundal is ready.